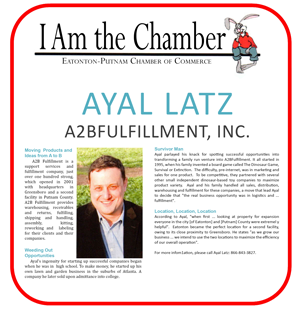 a2b Fulfillment is a support services and fulfillment company, just over one hundred strong, which opened in 2001 with headquarters in Greensboro and a second facility in Putnam County. a2b Fulfillment provides warehousing, receivables and returns, fulfilling, shipping and handling, assembly, kitting, reworking, and labeling for their clients and their companies. Ayal’s ingenuity for starting up successful companies began when he was in high school. To make money, he started up his own lawn and garden business in the suburbs of Atlanta. A company he later sold upon admittance into college.